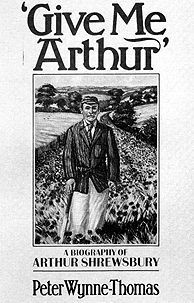 October 1985 saw the publication of Give me Arthur, the biography of Arthur Shrewsbury written by Peter Wynne-Thomas. 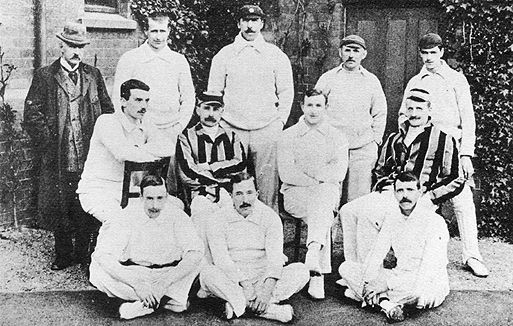 We produced our own brief account of this Notts and England cricketer back in Issue 13 but Peter Wynne-Thomas has brought to light so much new material about Arthur Shrewsbury that a second feature on this Victorian sportsman was more than merited. Many readers will not be familiar with the name of Arthur Shrewsbury, so by way of an introduction we quote from the flyleaf of Give me Arthur. 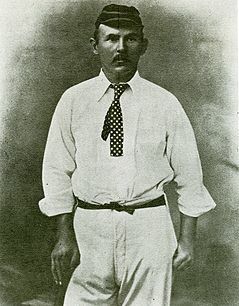 'In a career lasting from 1875 to 1902, Arthur Shrewsbury, the Nottinghamshire opening batsman, led the first class batting averages seven times, attained the highest seasonal average of any batsman to date and hit ten double centuries. He was an automatic choice for England, twice captaining his country in a series against Australia. 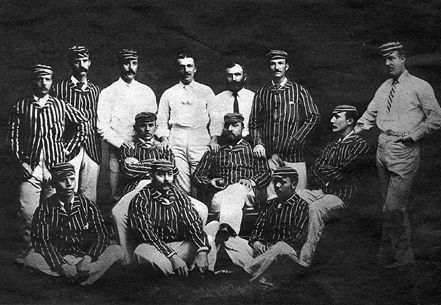 Shrewsbury also financed and managed four England touring teams to Australia, led the great strike of Notts' professional players of 1881; and ran in conjunction with his Notts and England team mate Alfred Shaw, one of the leading sports goods businesses of his day'. The flyleaf then concludes in the following fashion. 'Having unearthed the last diary of Arthur Shrewsbury and some three hundred of the player's letters, Peter Wynne-Thomas has been able to unveil the complex nature of this remarkable man. Convinced he was suffering from an incurable disease, Shrewsbury committed suicide in 1903 - an enigmatic demise for the cricketer who was the first modern professional batsman and the model from whom Jack Hobbs, Herbert Sutcliffe, Len Hutton and Geoff Boycott were to develop'. Willoughby Street area with Kyte Street highlighted in colour. Peter Wynne-Thomas's decision to write Give me Arthur came about because of a chance encounter a couple of years ago. Someone arrived one day at the Trent Bridge cricket ground asking if anyone there could identify an old cricket bat in his possession. Peter, the Club's archivist, was asked to have a look at it. He identified it as owned by J.A. Dixon and on learning that the enquirer's name was Mr. Gerald Shrewsbury, casually asked if he was any relation to the famous Arthur Shrewsbury. The answer was yes and that Gerald was Arthur's great nephew. Peter knew that Arthur Shrewsbury was supposed to have left some diaries and enquired of Mr. Shrewsbury whether he knew of their whereabouts. To his surprise, Gerald Shrewsbury said he had diaries, a large number of Arthur's letters and several photographs stored away at home. The letters proved to be carbons of letters written by Shrewsbury. Many were to do with his sports equipment business while others shed considerable light on the difficulties Arthur faced while organising overseas cricket tours. Spurred on by this discovery Peter tried to get in touch with other members of the Shrewsbury family. After appeals in local papers, he discovered the whereabouts of five. With their help and many hours spent scanning registers of births, marriages and deaths, Peter built up the Shrewsbury family tree which appears at the end of his book. This family tree was constructed to help him try and trace any surviving relatives who might still have old family photographs and letters. Chief among Peter's hopes was that he would turn up an early photograph of Arthur, his brothers and sisters, or even of his parents - disappointingly none was ever found. Arthur's parents William and Mary Ann Shrewsbury married in 1843 and chose to set up home in Willoughby Street, New Lenton. Six children had already been born by the mid-1850s when the Shrewsburys decided to move. Had they resolved on a major change of scene, we would have lost the chance to claim Arthur Shrewsbury for Lenton's Hall of Fame. 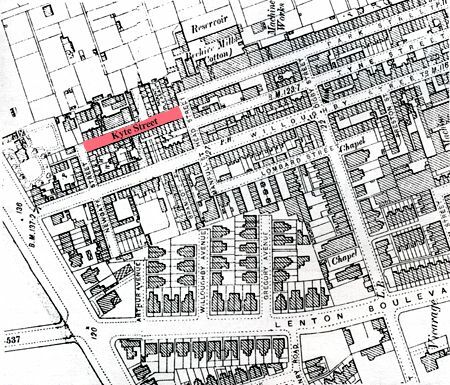 Fortunately they settled on a house in nearby Kyte Street and Arthur, their seventh child was born there soon afterwards on April 11th 1865 (Kyte Street is now no more, having disappeared in the 1960s when the Willoughby Street area underwent redevelopment). Peter Wynne-Thomas calculates that Arthur spent his first eight years at the Kyte Street residence, whereupon the Shrewsburys moved up the Derby Road to one of the terraced houses on Wellington Square. William Shrewsbury was employed as a draughtsman-designer at the lace firm of J.T. Hovey on Stoney Street in Nottingham. In 1869, however, he gave up this job in order to become the licensee of The Queen's Hotel, which still stands near the Midland Station. 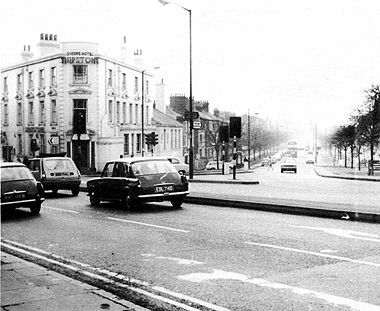 The Queen's Hotel was to remain Arthur's home base for the next thirty two years. At the age of nineteen Arthur Shrewsbury began to play regularly for Notts County Cricket Club. Arthur's batting soon began to receive critical acclaim and before long he was being selected for inclusion in such representative matches as the Players v. Gentlemen. In 1879 Arthur was one of seven Nottinghamshire players signed up by a Nottingham businessman to play matches in Canada and the USA. It is interesting to note that all but one of these games was played against the odds. That is the opposing teams were allowed extra men, in fact anything up to eleven extra. Peter Wynne-Thomas doesn't comment on how this English team fared in the New World but does suggest that while on tour Shrewsbury and Alfred Shaw, another Notts player, probably finalised their plans to open a sports equipment business in Nottingham. This was launched the following year as the Midland Cricket, Lawn Tennis, Football and General Athletic Sports Depot. Later it was to be changed to 'Shaw and Shrewsbury' which at least had the merit of brevity. Despite the enormous distances involved, English cricket teams had been going out to Australia ever since 1861-2. In 1876 Jim Lilleywhite, the Sussex medium pace bowler, organised a tour of Australia which made him a handsome profit. Eager to repeat the experience, he began to make arrangements for another tour during the winter of 1881-2. He asked Alfred Shaw to help him finance it and as Shaw was in business with Arthur Shrewsbury, it seemed sensible to include Shrewsbury. This time Peter Wynne-Thomas details all the dealings behind the scenes and what actually happened in the matches. He concludes by saying that the tour was a success and made each of its organisers £700 profit. As Peter's book makes clear, Arthur Shrewsbury was not only an exceptional cricketer but he also had a keen head for business. The profits from this Australian tour obviously whetted his appetite for more tours - and he was to be involved in the organisation of a further three. The first of these three tours returned a modest profit, but the others were financial failures, the last spectacularly so. This final tour in 1887-8 suffered from the problem that there were two rival English teams out in Australia at the same time. Shrewsbury's tour lost some £2,400. Once it became clear that the tour was likely to be a financial liability it was decided to try and recoup the losses by following it with a rugby football tour, the first of its kind. So Arthur Shrewsbury remained in Australia to manage the rugby tour. This meant he was to miss a whole season of cricket back home. Unfortunately the rugby tour fared no better and lost £600. All in all, the whole thing was a shambles. And what was to make matters even worse was that Jim Lilleywhite, one of the three organisers, proved incapable of shouldering any of the debt. So it was left to Arthur Shrewsbury and Alfred Shaw to stump up some £1,600 each. Thereafter Arthur confined his cricket to home territory. in 1973. Photograph courtesy of the Nottingham Local Studies Library. Peter Wynne-Thomas engagingly relates the details of Arthur's cricketing endeavours, both the highs and the lows. In among these were periods of inactivity. Dogged by apparent poor health, Shrewsbury often managed to play for only part of the summer. In 1894 he played no first class cricket at all, but on this occasion it may not have been simply a question of ill health. The cricketing press of the time ascribed the reason for his absence as bouts of asthma and bronchitis. Peter, however, came across one of his letters which indicated he'd never had any intention of playing very much cricket that year owing to his need to keep a closer eye on the sports business. Moreover he regularly turned out on Saturdays for Notts Castle C.C. and scored several hundreds for the Club that season. So here is a hint that his 'ill-health' may occasionally have been a convenient excuse. At other times there is also the suggestion that some of this 'ill-health' was all in Arthur's mind - that he was something of a hypochondriac. Certainly the question of Shrewsbury's health or lack of it is of crucial consideration when considering his suicide in 1903. Soon after the end of the 1902 season Arthur Shrewsbury began to complain of pains in his kidneys. He then consulted various doctors and in February 1903 entered a nursing home in London for medical tests. No one could discover anything seriously wrong with him and he returned to Nottingham. He went to stay with his sister at her home in Gedling and his health appeared to be gradually improving. In May, however, he went to a Nottingham gunsmiths and purchased a revolver. A week later Shrewsbury was back at the shop explaining that he was having difficulty loading the gun. It was soon discovered that the wrong bullets had been bought. The mistake was rectified. That evening Arthur Shrewsbury shot himself. He was 47. All these details came out at the inquest held the following day. The coroner decided that Shrewsbury had taken his own life, his mind being quite unhinged by the belief that he had an incurable disease. He added, however, that there was no evidence to show that he suffered from any major illness. He was buried the day after the inquest in the churchyard of All Hallows, Gedling. The only person present in the house at the time of Arthur Shrewsbury's suicide was his girlfriend, Miss Gertrude Scott. She was later found to be the main beneficiary in his will, being left all his personal effects and £1,000. Peter Wynne-Thomas was obviously keen to try and find out what might have happened to these personal effects. He found that Kelly's 1916 Nottingham directory included a Miss Gertrude Scott as resident at 119, Castle Boulevard. In the next directory the same address now housed a Mrs. Shacklock. Peter knew that in the 1930s silverware which had once belonged to Arthur Shrewsbury had been purchased by Notts C.C.C. from a Mr. Shacklock. So it seemed extremely likely that Miss Scott became Mrs. Shacklock. After 1920, however, there are no further mentions of the Shacklocks in any subsequent directories, which suggests that they may well have left Nottingham. Peter made appeals via the local papers for help with his enquiries regarding the Shacklocks but drew a blank. The Shacklocks may now have to remain 'lost' for ever, but not so Arthur Shrewsbury. Courtesy of Peter Wynne-Thomas's excellent book, the story of this son of Lenton is brought before a wider public. We warmly recommend it. Give me Arthur is published by Arthur Barker Ltd. and is priced at £9.95. The title is reputed to be the answer given by W.G. Grace when asked with whom he would most prefer to open England's batting.